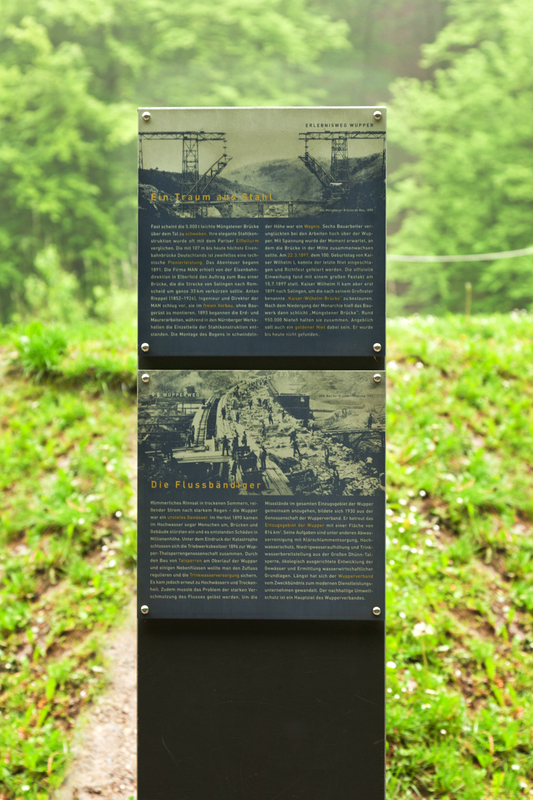 Nature meets technology and an idyll is supplemented by the art of engineering – that’s the best way to describe the cultural landscape park created under the famous Müngsten bridge in 2006. A broad set of steps and sloped areas of grass in the traffic-free valley along the Wupper river are an invitation to visitors to linger in the park. Walkways high above the Wupper, plateaus close to the water’s surface and beach-like areas create a variety of experiences. The steep reinforcement of the shoreline with greywacke blocks stacked using the dry construction method incorporated embankments which were already present before the park’s development while simultaneously preventing visitors from entering the Wupper along the entire shoreline. Account was thus taken of issues relating to nature conservation and water management. The reduced range of materials used in the development of the park (concrete, greywacke, wood) and the careful choice of colour (anthracite) ensured the creation of an area with a suitably tranquil atmosphere. An access path running alongside the Morsbach stream and beneath the roads brings visitors into the park. The landscape can already be experienced on this walk – signs convey the history of the industrial culture of the location’s past. The second path into the park leads down the steep slope from Schaberg railway station into the valley for 100 metres. Slides, rope paths, “a stairway to heaven”, wobbly sheep and a section with steles provide shortcuts and turn the route into a game, above all for children. An area with a broad flight of steps down to the Wupper stretches out at the centre of park between the old Schaltkotten building and Haus Müngsten. A physical model – a tactile model for partially-sighted visitors – can also be found here. 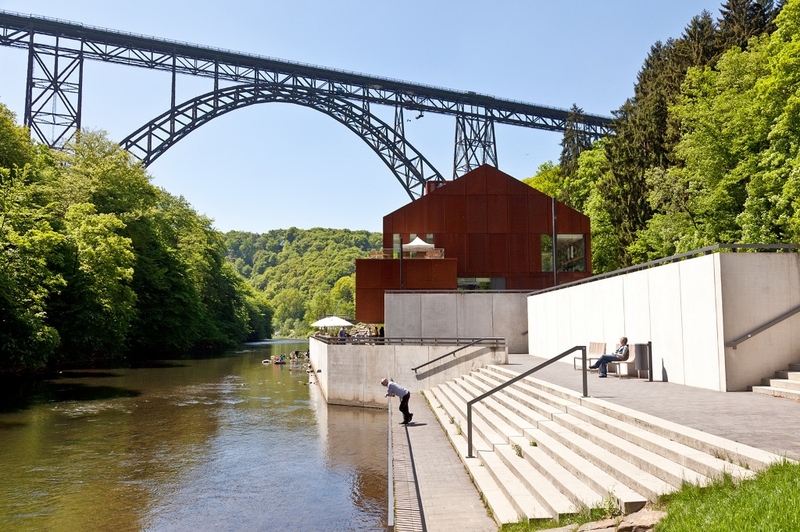 The restaurant building is a striking structure with a facade of Corten steel directly on the Wupper river. The spacious modern layout creates many inward and outward views, thus linking the interior of the building closely with the landscape under Müngsten bridge. Sloped areas of grass behind Haus Müngsten in the traffic-free valley along the Wupper are an invitation to visitors to linger in the park. Walkways high above the Wupper, plateaus close to the water’s surface and beach-like areas create a variety of experiences. The steep reinforcement of the shoreline with greywacke blocks stacked using the dry construction method incorporated embankments which were already present before the park’s development while simultaneously preventing visitors from entering the Wupper along the entire shoreline. Account was thus taken of issues relating to nature conservation and water management. The area of grass is succeeded by the rocky path over the Zwergenklippen (“Dwarves’ Cliffs”) to Burg. Poetry on rocks provides information in artistic form on stories and legends about the hills. Visitors can get to the steps-free trail towards Schloss Burg on the other side of the Wupper by using the suspension ferry: a platform glides silently for 60 metres on taut ropes strung across the river. This becomes a special experience due to the fact that the ferry is muscle-powered and the passengers are accompanied by ferry operators who have stories to tell about the park and valley. The Müngsten riddle is ideal for those who wish to know more: each steel question plate has a twin in the park and the solution is presented in a poetic story when a person stands on this. Müngsten bridge seems to hover above the valley. Its elegant structure weighing just 5,000 tonnes has often been compared to the Eiffel Tower in Paris. The 107-metre railway bridge remains the highest in Germany today and is undoubtedly a technological masterpiece. A serial application from the region together with comparable bridges (Portugal, Spain, Italy) is therefore under preparation to have them recognised as world cultural heritage sites. The Lebenshilfe organisation with its committed approach to inclusion is currently responsible for managing the restaurant and the manned suspension ferry as well as for the care and maintenance of the park.